Are you sick of the incessant depressing economic news? Head to Giant Food stores where, with a prescription of course, you can get yourself some free drugs. 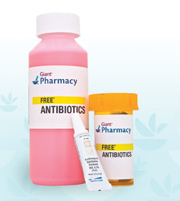 The supermarket chain started a program on January 2 that offers a free two-week supply of generic antibiotics like amoxicillin and penicillin completely gratis. The program lasts until March 21, so if you have a bacterial infection, Happy New Year to you! The FAQ page on Giant Food's Web site states the program is part of a health and wellness initiative. And the store's EVP, Robin Michel, is quoted in The Washington Post saying, “Times are tough” and the program is a way to help people when money is tight. The pharmacy business has really heated up since Wal-Mart began offering $4 prescriptions in 2006. The move caused other retailers to look for ways to compete; Giant dropped the price for a 90-day supply of some drugs to $9.99 over the summer. It's hard to beat free, and if you can't beat 'em, join 'em. Giant drew attention to its stores and pharmacies with the ploy. The move is also getting a positive response in the media, while other supermarket chains like Stop & Shop and Wegemans now have similar programs. Every business with something to sell seems to be offering a freebie in response to the recession. No-cost medicine might be the best giveaway so far.